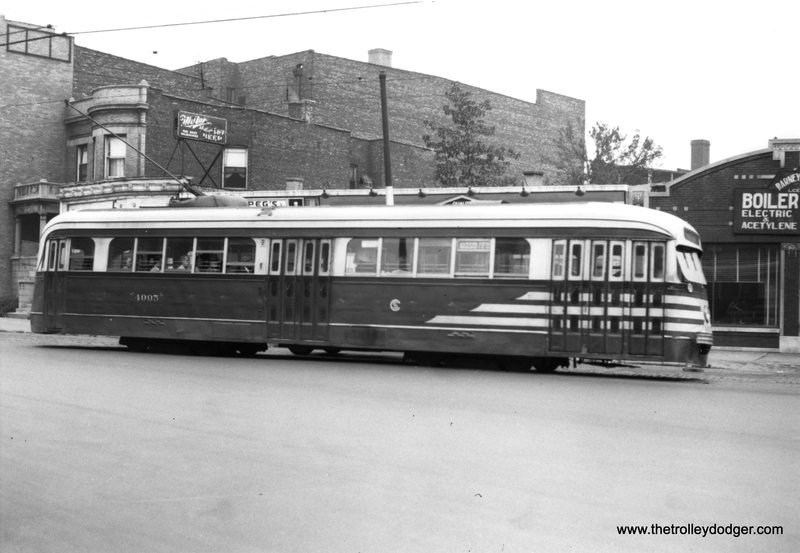 Continuing on from our recent article Chicago’s Pre-PCCs (May 5), by 1936 the Presidents’ Conference Committee, by then renamed the Electric Railway Presidents’ Conference Committee (ERPCC), had developed a streamlined modern streetcar. 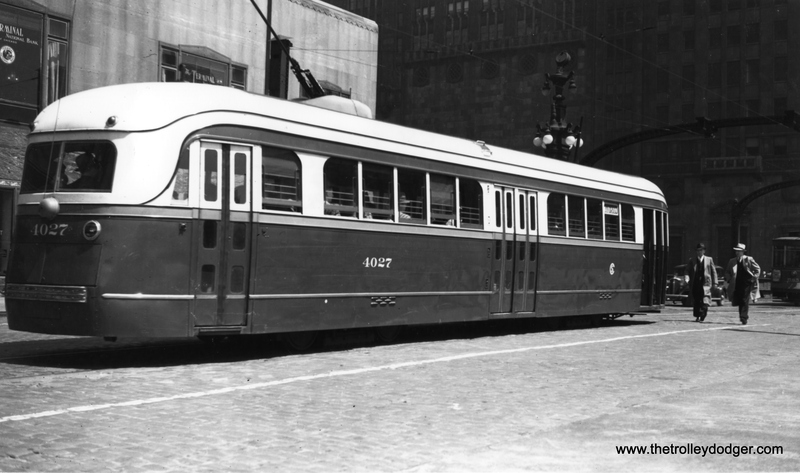 Chicago was very much involved in this, and ordered 83 PCC cars in 1936. 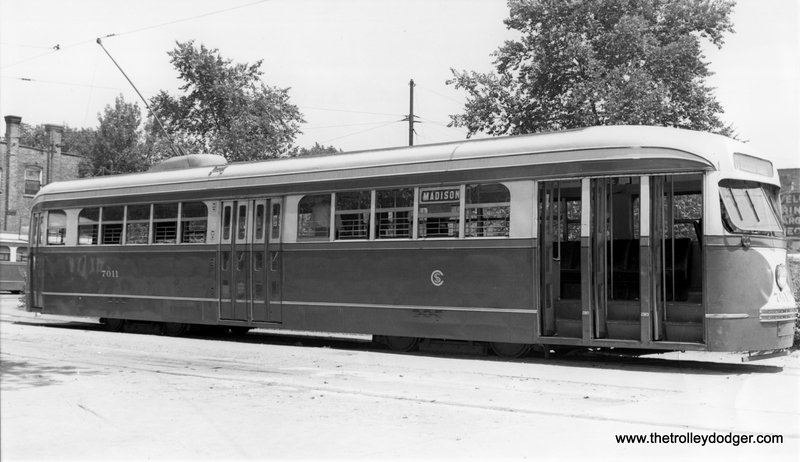 These were built by St. Louis Car Co. and were numbered 4002-4051 (owned by Chicago Railways) and 7002-7034 (for Chicago City Railway). The split numbering was due to the Chicago Surface Lines being a unified operating association made up of constituent companies. To give you some background information on Chicago’s first batch of PCCs, here is an interesting article from the December 1936 issue of Armour Engineer and Alumnus. The Armour Institute is now the Illinois Institute of Technology. Author Ralph H. Rice was Principal Assistant Engineer in charge of the work of the Board of Supervising Engineers, a partnership between the City of Chicago and the Chicago Surface Lines. The Settlement Ordinance of 1907 imposed various operating requirements on two of the underlying companies, the Chicago City Railway Company and Chicago Railways, and established a new bureau, the Board of Supervising Engineers (Chicago Traction), a board of engineers and accountants with responsibilities for assuring compliance with the ordinances, and setting standards for equipment and construction. 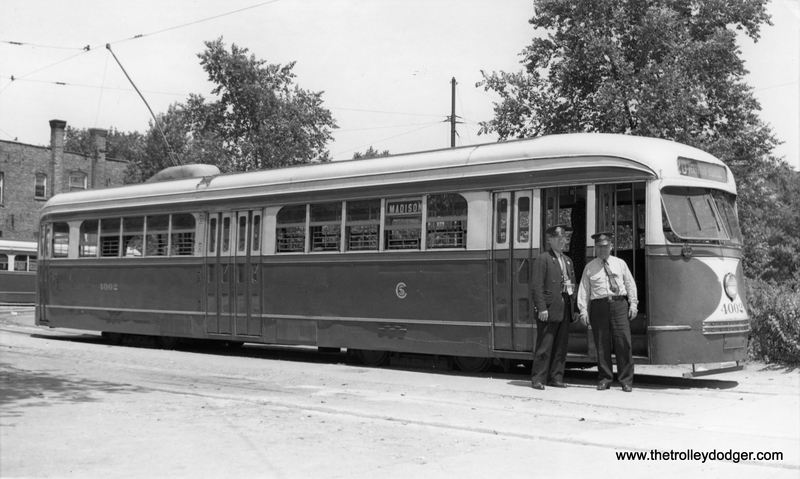 It is important to note the role played by the City of Chicago, working in partnership with the Chicago Surface Lines through the Board of Supervising Engineers, in developing the specifications for Chicago’s prewar and postwar PCC streetcars. 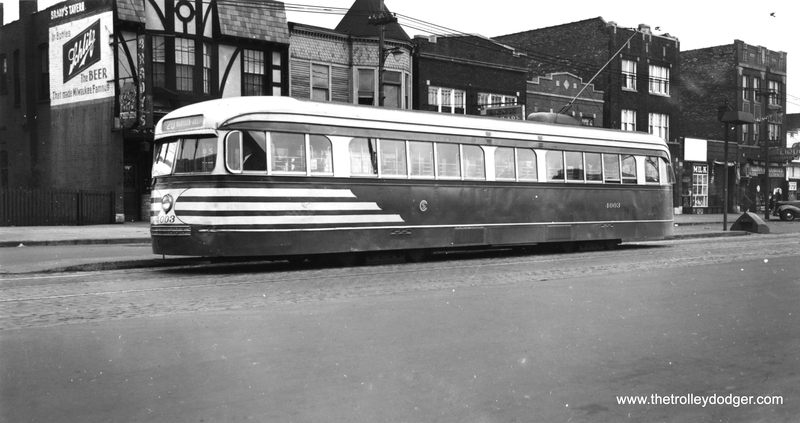 The Chicago cars were unique in that they were longer and wider than the standard single-ended PCCs used in other cities. They were designed for two-man operation, and had three sets of doors. They were initially put into service on CSL route 20 – Madison, which was considered representative and offered a wide variety of operating conditions. 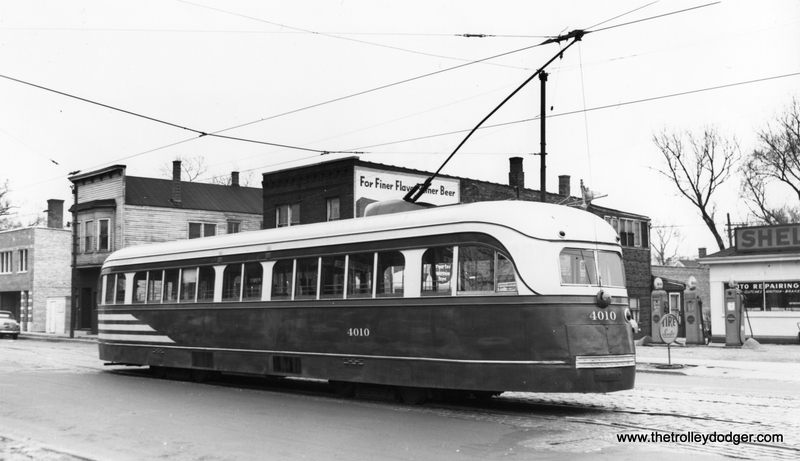 It ran downtown and through the neighborhoods to the city limits, and also had a branch line (Madison-Fifth). 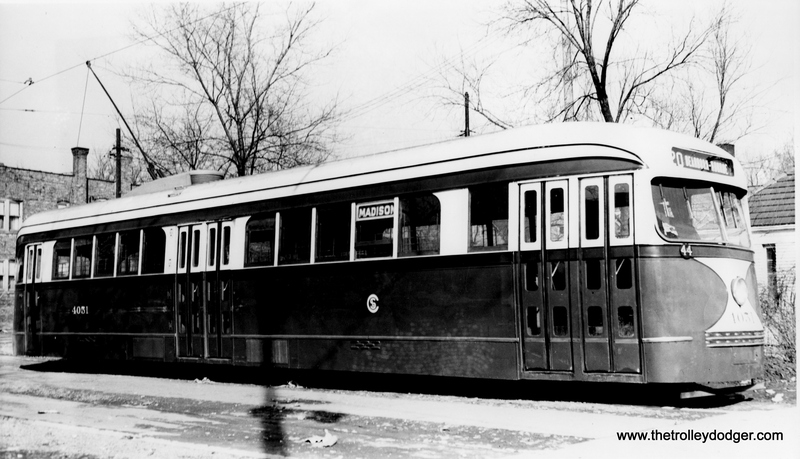 Even so, the 83 PCCs put into service in 1936-37 were not enough to handle the entire schedule on Madison, which to some extent actually competed with the nearby Garfield Park “L” rapid transit line. 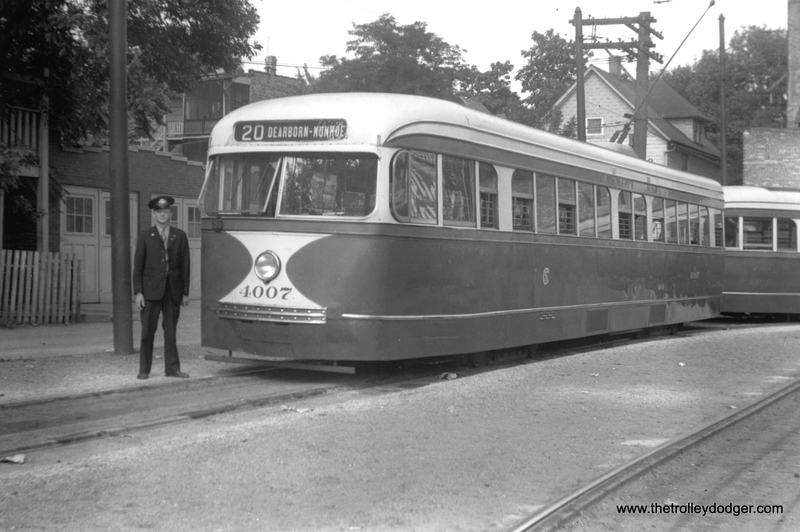 The prewar PCCs were popular with the riding public, and as a result, ridership increased, and the cars ran faster than those they replaced. 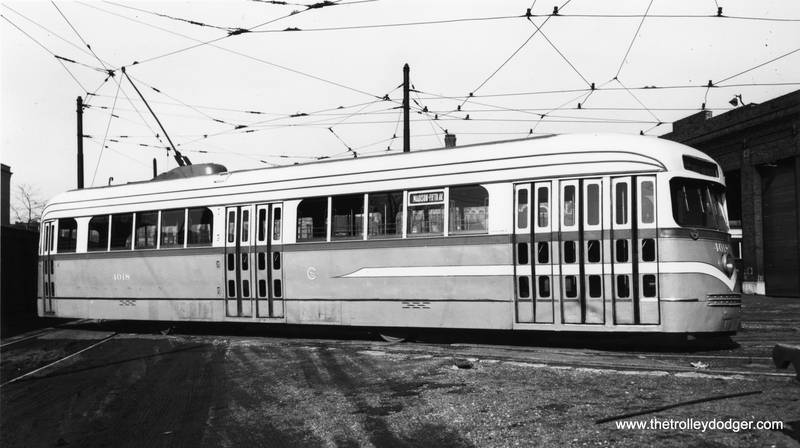 By 1939, the City of Chicago, anticipating transit unification of the Surface Lines with the Chicago Rapid Transit Company, developed a modernization plan that called for a total of 1000 modern streetcars. 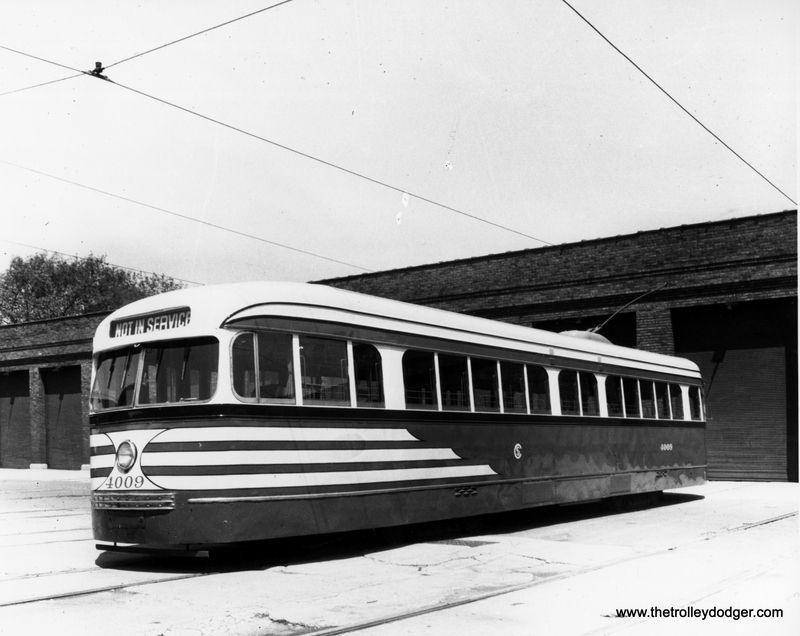 Over many years, Chicago’s trolley riders paid into a modernization fund, and by the start of World War II, millions of dollars were available for purchasing new streetcars. However, wartime shortages made this impossible until 1945. 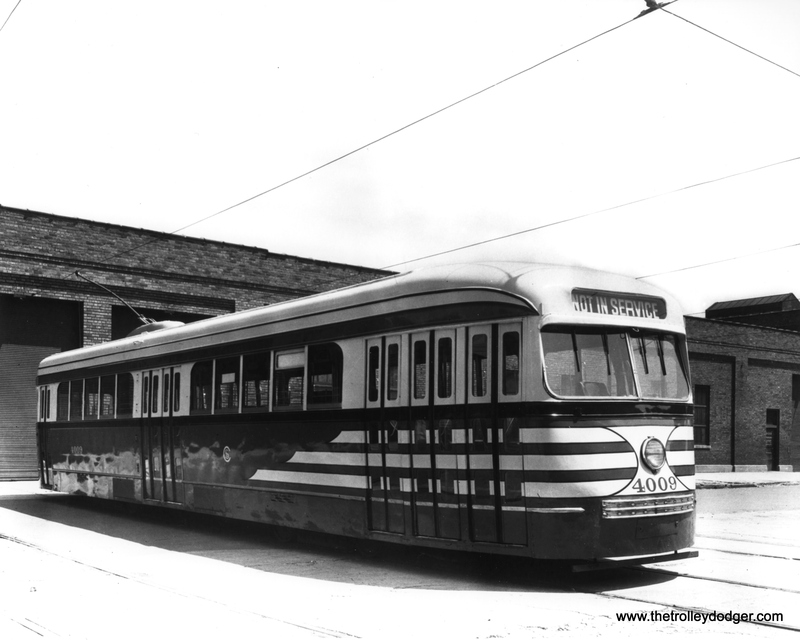 With the delivery of more PCCs, the original 83 cars were shifted to other lines, ultimately running on Cottage Grove, 63rd, and Western, before being retired after nearly 20 years of service in 1956. Could they have lasted longer? 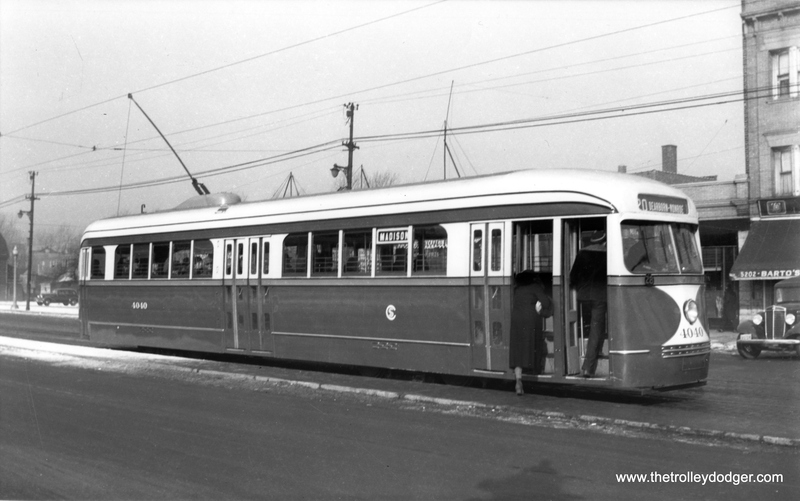 A 1951 CTA (successor to the CSL) consultant’s report stated that the cost of maintaining these cars was increasing. 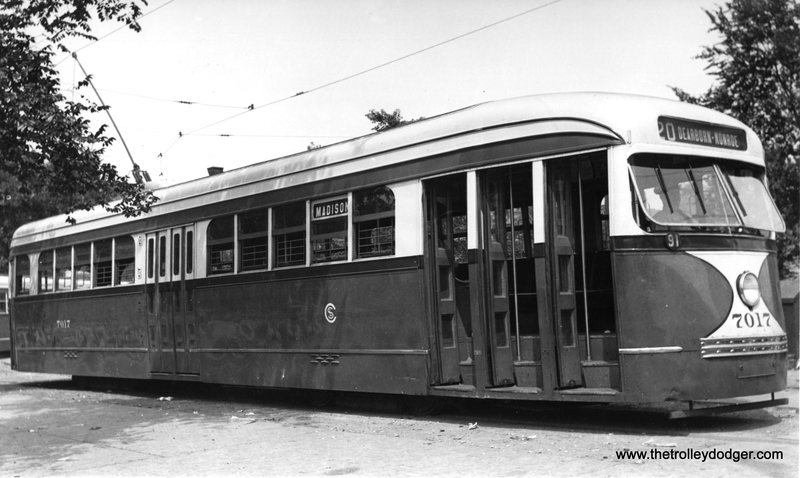 By the standards of the time, the CTA considered streetcars to be fully depreciated after 20 years’ use. 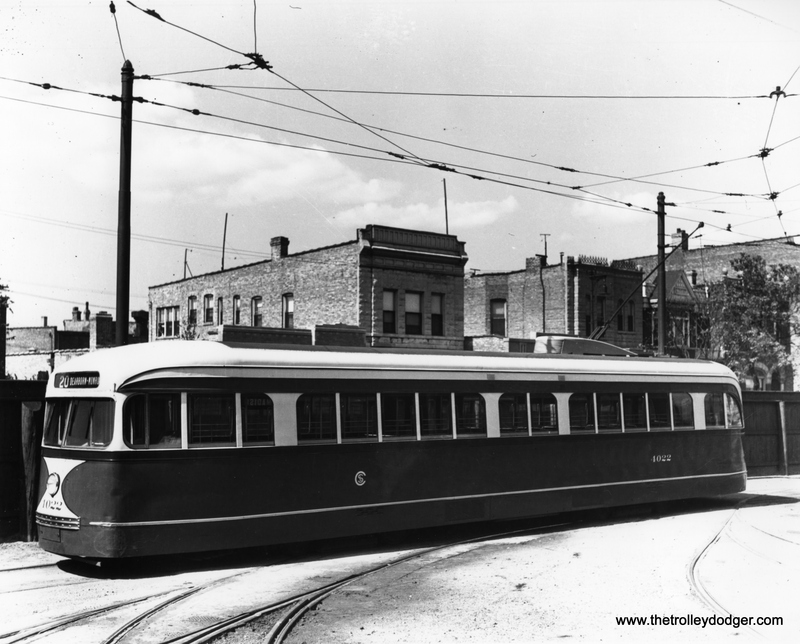 Although the 83 cars from 1936 had seen a lot of use, there is no doubt they could have continued in service if not for the fact that the CTA wanted to phase out streetcars as soon as possible. Similar considerations were at work when the 100 CSL Sedans (aka “Peter Witts”) were retired and scrapped in the early 1950s, after little more than two decades of service. 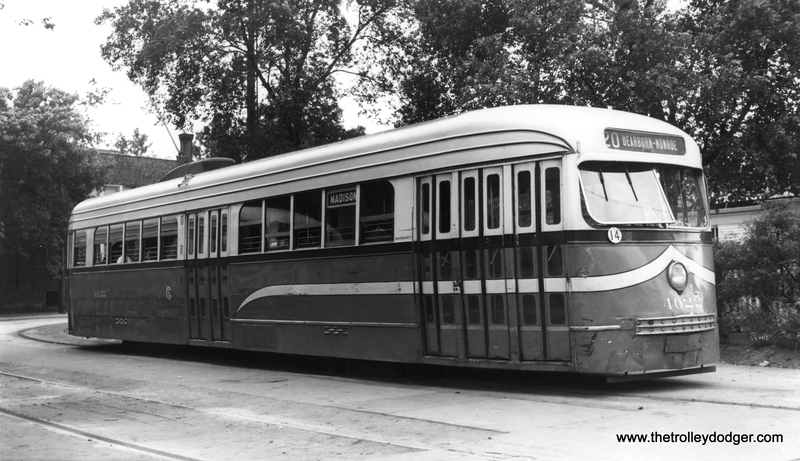 Other cities such as Toronto managed to keep their streetcars running for a lot longer than 20 years, under hard use. 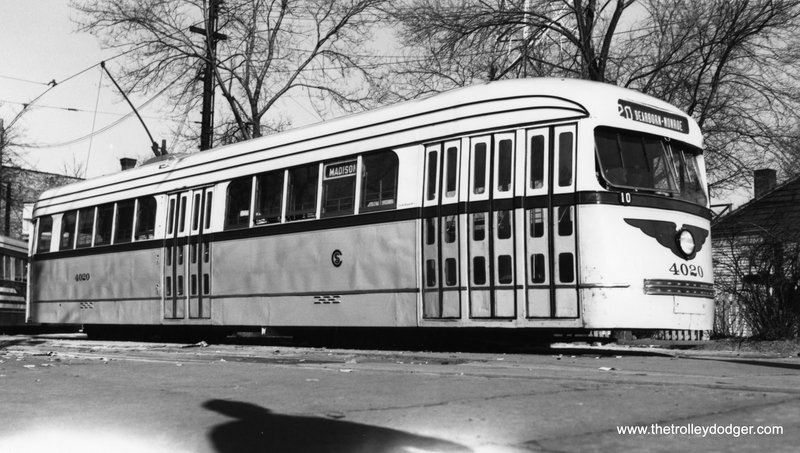 The only other possible use that CTA had for the prewar cars in 1956 would have been to put them in use between Forest Park and Wheaton, as a “light rail” replacement for a portion of the Chicago, Aurora & Elgin interurban. Unfortunately, no funding to operate such a service was forthcoming (see our article The CTA, the CA&E, and “Political Influence”, February 18) and the CA&E was abandoned without replacement. This plan, while stillborn, may have helped influence the Skokie Swift, which began service in 1964 over five miles of abandoned North Shore Line interurban trackage. Only one of the 83 prewar cars has been preserved. 4021 is now on static display at the Illinois Railway Museum. 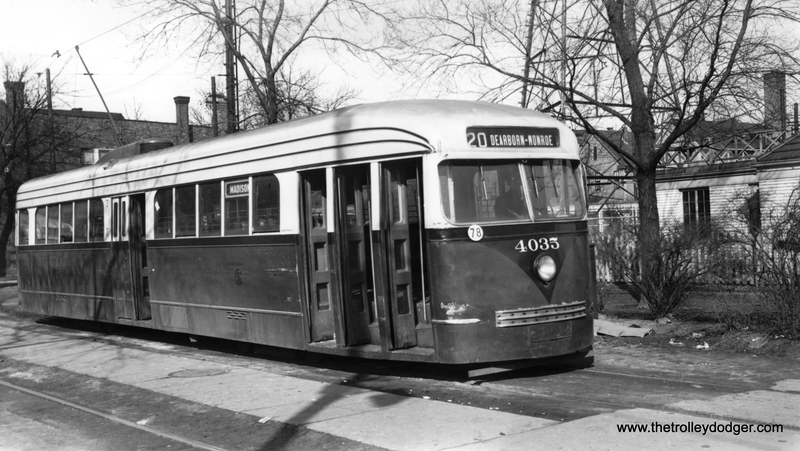 For many years, it was stored as part of the CTA’s Historical Collection, but the body was damaged when it was improperly handled while being moved from one location to another. Since arriving at IRM in the mid-1980s the car has been repainted and made to look a lot more presentable from the outside. El Paso has put out a request for proposals to rebuild several prewar PCCs of about the same vintage as Chicago’s. These have been stored in the desert for 40 years. 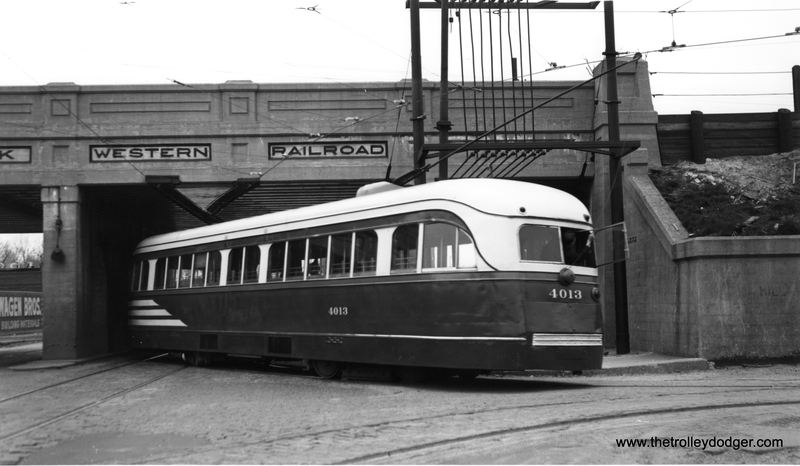 This may present a unique opportunity to help restore the last remaining prewar Chicago PCC. Since it is likely that the El Paso cars will receive all new mechanical parts, it is hoped that some of the original parts, rather than simply being discarded, could be used to help bring CSL 4021 back to operating condition in the future. Or, at least, that is my hope. 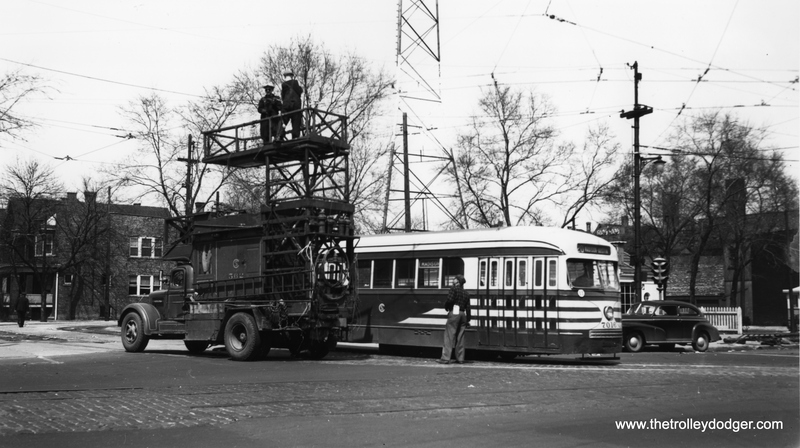 Meanwhile, I hope that you will enjoy seeing these classic pictures of Chicago’s prewar PCCs in action. 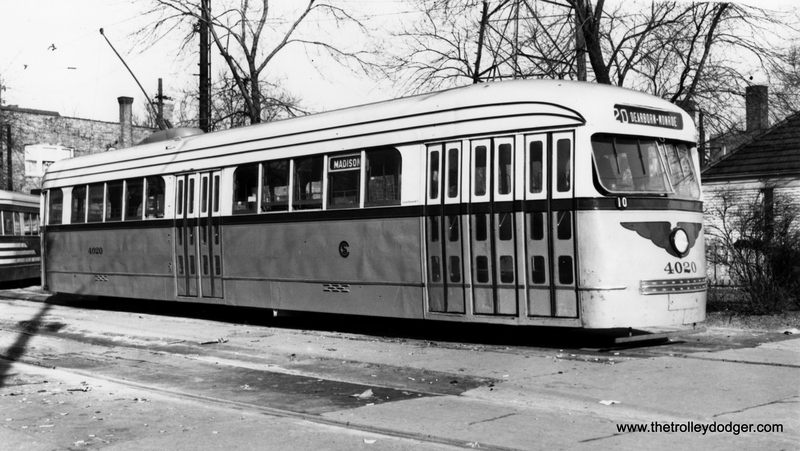 CSL 4035, in experimental colors, at Madison and Austin on November 2, 1946. 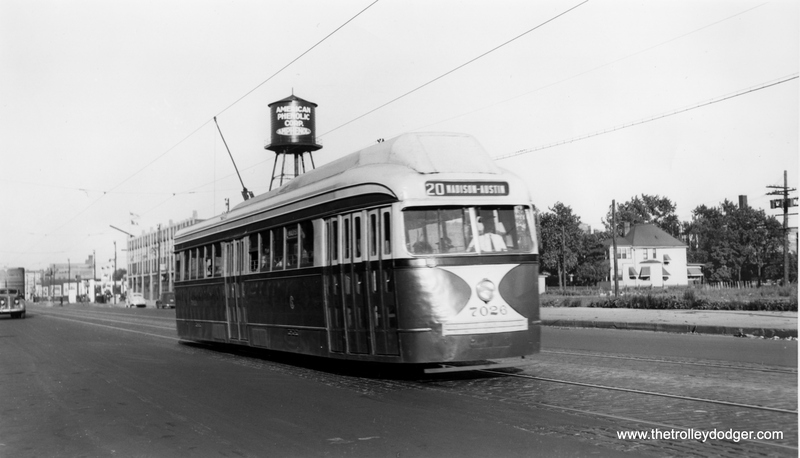 CSL 7017 at Madison and Austin in 1938. CSL 4022 in experimental colors at Madison and Austin. 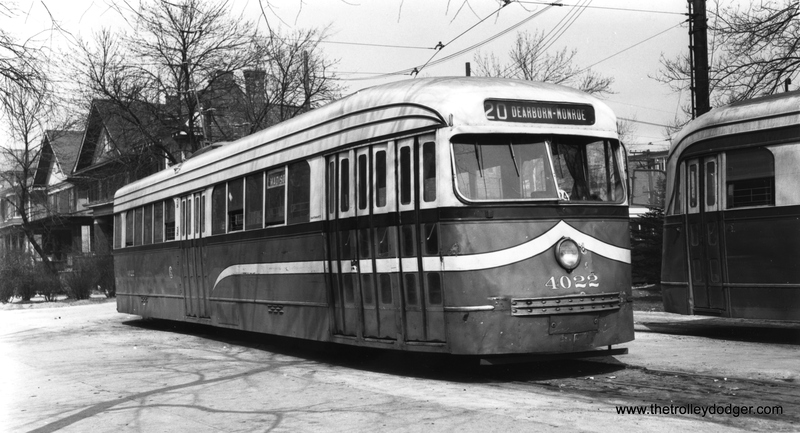 Circa 1945, we see CSL 7026 fitted with experimental forced-air ventilation of the type used in some Boston PCCs. It was not used on the postwar Chicago cars. CSL 4028 and 4010 pass at Madison and Hamlin in early 1937, shortly after entering service. We are at the west end of Garfield Park. 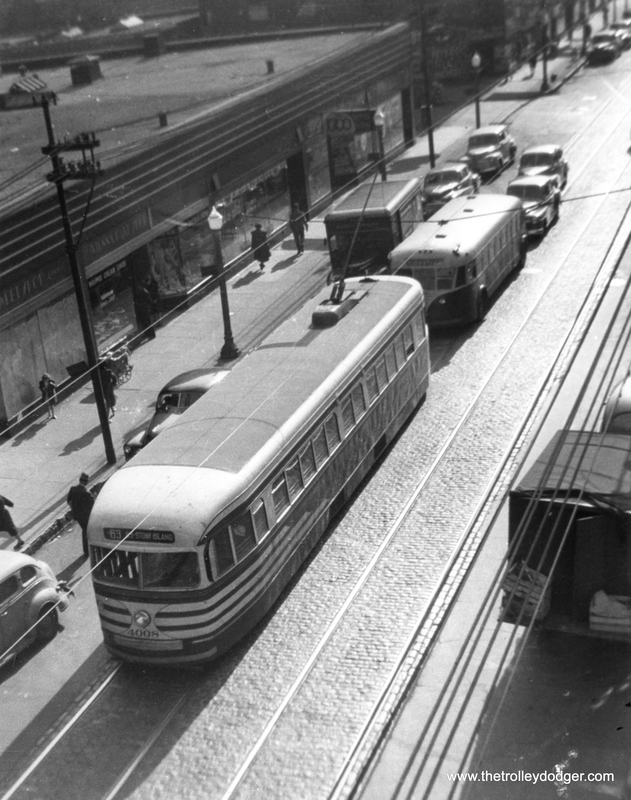 CSL 4008 eastbound on 63rd Street in 1947. Car 4013-image 945 is under the Grand Trunk Western overpass at 63rd and Central Park. Thanks. I will update the caption accordingly. Thank you for this, greatly appreciated. I was puzzled by the picture of 4010, identified as being at 63rd and Central Park, seemingly facing the “wrong way”. So, 4013 was backing into the wye there, and 4010 was on the westbound track about to cross over to the eastbound track. The 1952 CTA map states 15-minute owl service from 3:40 am to 4:50 am from Central Park east, 30 minutes west of there. Just imagine owl service more frequent than 15 minutes on the busiest part of the line before 3:40 am. I’d like to see how the CTA would have attached third-rail shoes to the PCC’s, since I assume they had the same offset truck kingpins as the Green Hornets. Hung on the skirts, maybe? And if 83 cars weren’t enough to service Madison Street, I have to wonder how well they would do running to and from Wheaton. Actually they figured service Desplaines to Wheaton would take no more that 27 cars, which is what was left at that time. These plans were made in 1956 and, from what I have read, would have used the pre-war PCCs. 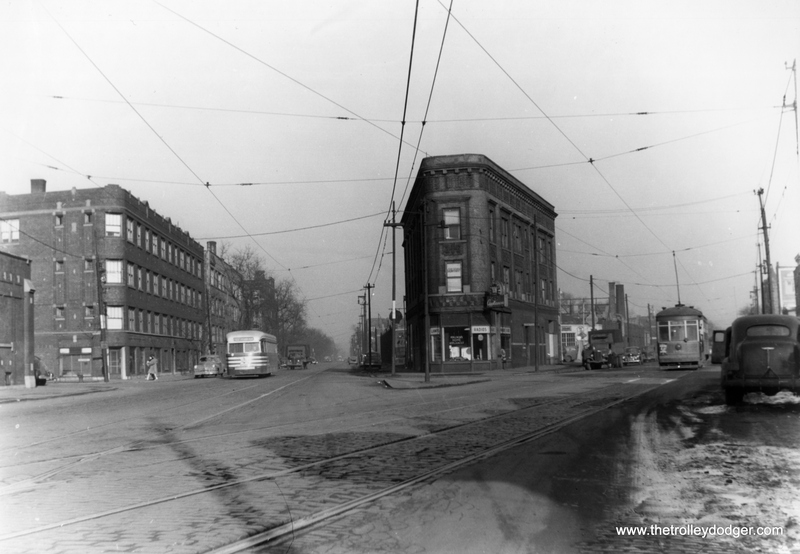 Thank you for the photo showing my old turf as a kid: Harrison, Springfield and Fifth. 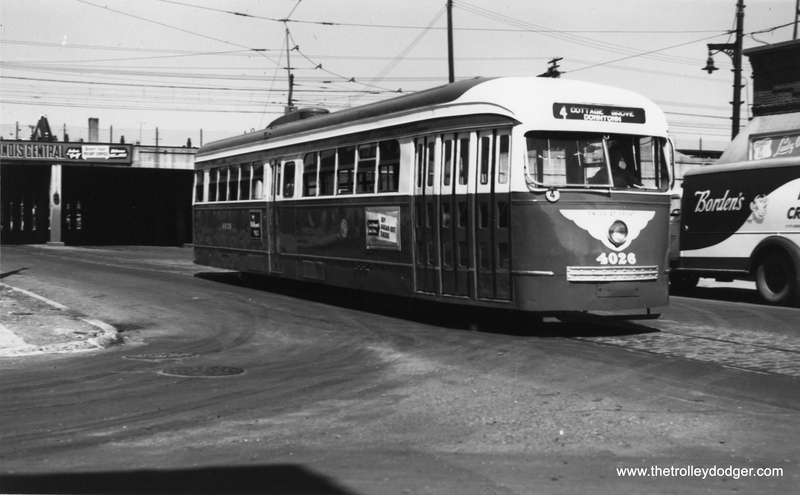 The Harrison line was converted in 1947 – a major disappointment for me. 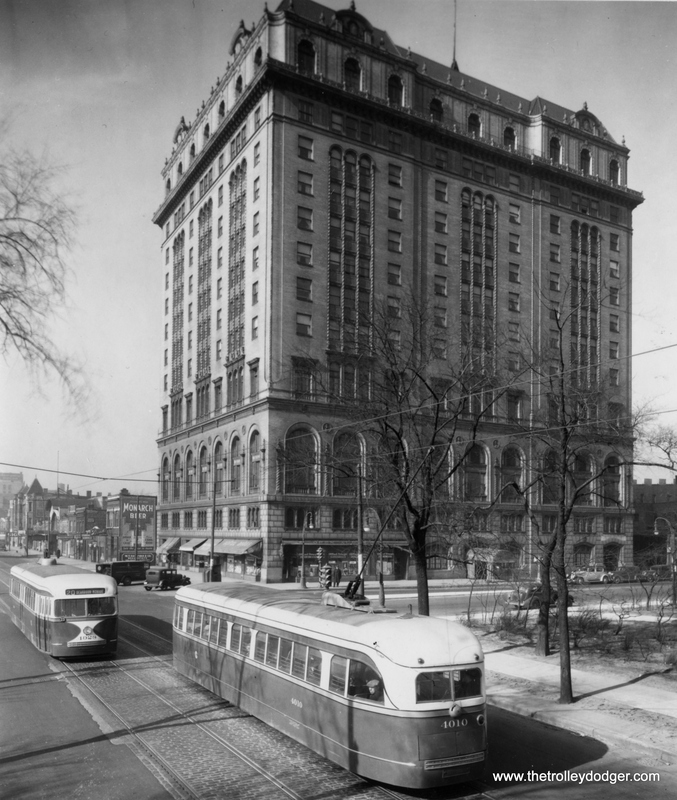 I remember walking from Springfield to Crawford (well, Pulaski) where I had the L, the 300 series big Pullmans, the 5th Ave. cars making that tight curve to head east on Harrison to Fifth and the Harrison cars clanking across the Crawford tracks. The L was in the background. All of this came to an end when we moved to Winnetka where I found the CNW and Shore Line of the North Shore Line a great place by Elm Street to continue watching trains. In any event the series brought back memories of not only the Fifth branch but Madison as well. Yes, I do remember the experimental paint schemes as well as the post-war cars that started running just before we moved out of the neighborhood. All of that is gone now with the freeway (sorry, expressway) running through the old neighborhood. 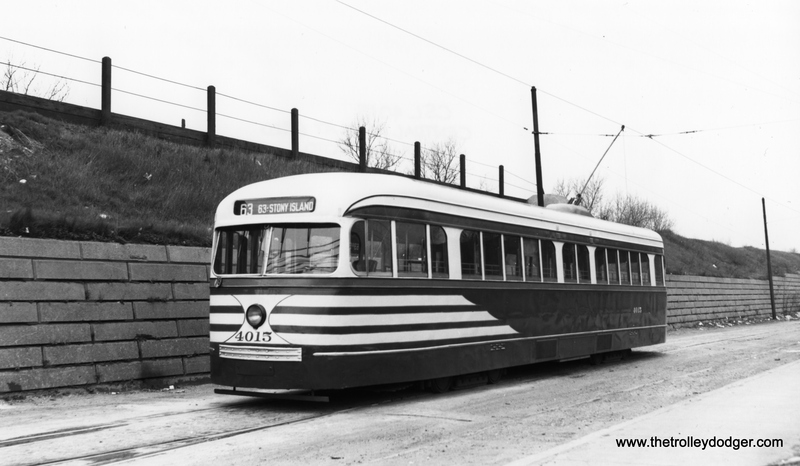 Car 4013 at 63/Central Park – this was a turnback point all day, even at night. Cars pulled up under the viaduct, backed into the wye north of 63rd, then turned east again on the WB track, then crossed over to the EB track. 4010 is between the wye and the crossover. Buses still wyed here until at least the 1960’s. How did they use all the doors on these cars? Kind of a modified version of the Peter Witt scheme. People entered at the front and paid in the middle. These were two-man cars. The door at the back of the car was for exiting only (but you had to pay before that, since you had to pass the conductor in the middle). Check out the blueprints here. Thanks so much for the explanation and blueprint.